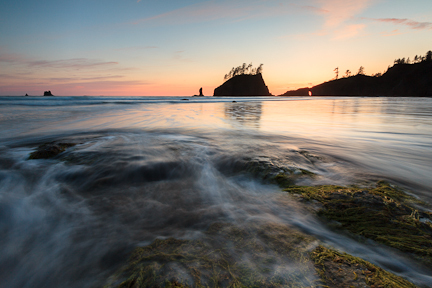 This entry was posted in Uncategorized and tagged Art Wolfe, Beach, Forest, Hall of Mosses, Hoh Rainforest, Jay Goodrich, Mountains, Ocean, Olympic National Park, Olympic Peninsula, Rainforest, Sea Stacks, Second Beach, Sol Duc Falls, Trees, Workshop by nixonphoto. Bookmark the permalink. In reality, how much time or acess did you actually have with Art Wolfe? With a class that large and that many assistants, I get the feeling very little. I would like to think that if i were paying that much money to attend a workshop with a world class photographer it woulf be a more intamite event. Just because they are a great photographer does not make them a great teacher. A strategy that I’ve used in the past is to stick with the workshop leader and ask lots of questions. This works even with big groups. All in all, I got enough attention and help from Art that I learned something useful.